The rumours are that Games Workshop has completed eighteen new plastic single figure sprues for the various Fantasy armies. These will be similar to the Warrior of Chaos and Vampire Counts figures released in the past few months. 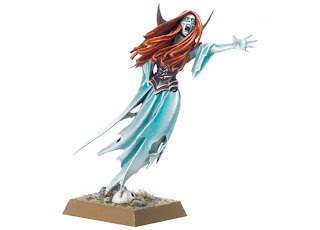 I’m really hoping this is true as while I think some of the figures have been “patchy” – the Necromancer, for instance – they represent a really good addition to the range. Personally I’m hoping that we’ll see the release of a couple of Skaven characters e.g. Chieftain with BSB option and a Plague Priest. It's good that GW are giving a little attention to armies that are not recent releases. On the other hand, the sculpts are not exactly setting the world alight. I collect both chaos and VC, but none of the recent single plastics are much good (with the exception of the Nurgle chap, who could be a decent character with some conversion work). Luckily, there are plenty more fish in the sea these days, with dozens of alternatives just the click of a mouse away.